Time is the most precious of resources. It seems that we never have enough of it and the result is a feeling of constant pressure to do things quickly. As a result, we fall into a pattern of making quick decisions, with incomplete information and then proceed to take hasty action and seek short cuts. Our busy lives, the business of those around us, the schedules we set ourselves and the constant stream of distractions and interruptions ensure we have very little time to do things well and we never seem to get things done. Against this trend towards doing more, in less time and at a faster pace is a trend towards slowing down, taking time and giving our minds time to catch up. Once we realise that as described by Chris Lewis we are moving too fast to think, we can start looking for an alternate course of action. The obvious answer is to slow down, to pause, switch off and take the time we need to reset but doing this requires deliberate action. We begin the process by recognising that taking our time, slowing down and being deliberate in the processes of thinking is a pathway towards becoming more productive, more creative and more attuned to the world around us. In what seems like a contradiction in terms, the best strategy for coping with the rapid pace of our lives is not to speed up but to slow down. In “Slow Looking” by Shari Tishman the reader finds an approach to slowing doing and taking the time needed to appreciate the finer details in the world around us. "Slow looking is a healthy response to complexity because it creates a space for the multiple dimensions of things to be perceived and appreciated. But it is a response that, while rooted in natural instinct, requires intention to sustain." For educators, the practice of slow looking will align well with strategies from the Visible Thinking movement. If you have used strategies such as “Looking Ten Times Two” or “Look and Look Again” you have experienced slow looking. By deploying strategies which require us to switch modes and adopt a more contemplative stance backed by deliberate efforts to notice things on multiple levels, we open our minds to new possibilities. When you use these strategies with your class you will notice a new depth of thinking emerge from your students. The initial conversation may well disappoint. Surface level thinking and seeing is ingrained and takes time and persistence to overcome. As the students begin to look more closely, to see more detail and notice more of the stimulus they are engaging with a change emerges. Gradually the students embrace the opportunity that slow looking offers. "The Red Tree" by Shaun Tan is a beautiful piece of creative work by a master of the picture book genre. Each page has multiple layers of detail and meaning. It is a book that deserves time and slow looking. In a unit aimed at Year Six students we invite students to immerse themselves in this text. We begin the exploration of selected pages using the slow looking strategy of “Looking Ten Times Two”. In this strategy students are invited to look at an image quietly for at least thirty seconds allowing their eyes to wander before they stop and list ten words or phrases about any aspect of the image. The process then repeats and can indeed repeat again. With each new looking more detail emerges. The students deliberately look for details they did not notice at the first looking. After two rounds of slow looking we invite the students to share their observations. As each student shares their notes, fresh ideas emerge and the discussion takes on a life of its own. Soon students are not just discussing what they saw in the image but are asking questions about the artist’s choices, the meaning of the image and their personal take-aways. The strategies of slow looking are not restricted to the visual. Consider looking as a synonym for perceiving and you see its potential across multiple disciplines. Tishman provides numerous examples of “slow looking” in disciplines away from those most immediately associated with the visual and through senses other than our eyes. 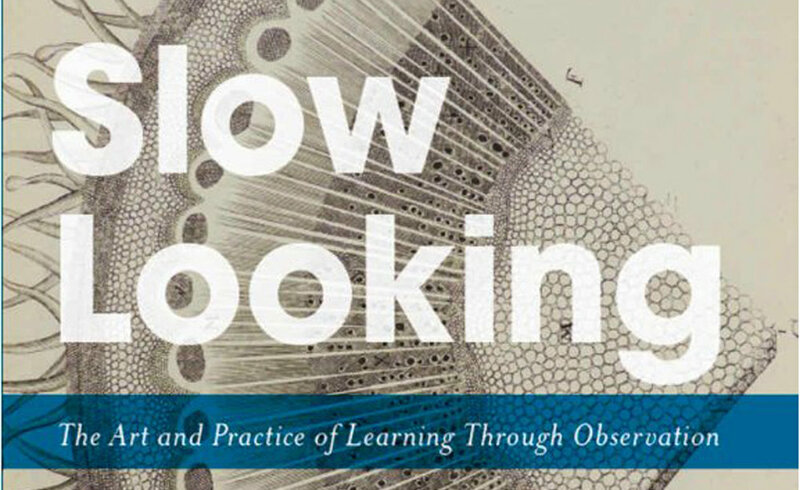 Consider the place of “slow looking” in science as an essential strategy for noticing what is taking place in an experiment or field observation. In music “slow looking” will allow the listener to notice subtle nuances in a piece and in literature “slow looking” encourages the reader to enjoy the language moves made by the author while the practice of slow looking is a valuable tool for the author to employ as they build descriptions. 'Slow Looking' is a highly recommended strategy and those looking to implement this in their classrooms or in their own lives should begin by reading Tishman’s book.